This isn’t a fourth dimension that you can disappear into or anything like that. Instead, two teams of physicists engineered special two-dimensional setups, one with ultra-cold atoms and another with light particles. Both cases demonstrated different but complementary outcomes that looked the same as something called the “quantum Hall effect” occurring in four dimensions. These experiments could have important implications to fundamental science, or even allow engineers to access higher-dimension physics in our lower-dimension world. There are three spatial dimensions, or directions you can move by holding everything else constant. Moving back and forth along a line is moving in one dimension. Make a right angle to the line and you add a second dimension to move forward and backward in—imagine a square. Make another right angle and you enter the third spatial dimension. You can move up and down—that’s a cube. If a fourth dimension existed, you could make another right angle into it, and create some sort of hyper cube. A fourth spatial dimension can be described by mathematics but not physically realized. However, think about this: a three-dimensional figure leaves a two-dimensional shadow. By observing this shadow, we can glean some information about the three-dimensional thing. Perhaps by observing some real-world physical system, we can learn about a fourth-dimensional nature by a shadow left in lower dimensions. 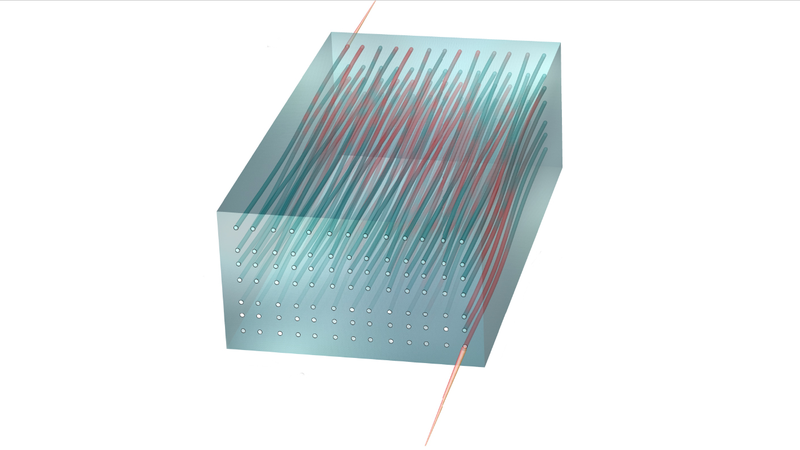 At each of the new experiments’ core is the quantum Hall effect: When electrons are confined to two dimensions, as if they are stuck on the surface of a sheet of paper (like in graphene or in certain layers of semiconductors), and a magnetic field is passed through that sheet perpendicularly, some of the system’s electrical properties become restricted to multiples of exact number values. Math says that other consequences of this quantum Hall effect should be measurable in a four-spatial-dimension system—but again, we don’t have four spatial dimensions to test this physics in. Both teams overcame this hurdle with specially engineered systems published today in the journal Nature. A team of European physicists trapped atoms of the element rubidium with sets of lasers in two dimensions—the experiment setup was kind of like an egg crate with atoms in it whose boundaries are governed by lasers. This created a sort of two-dimensional quantum “charge pump” that allowed them to simulate the transport of electric charges (atoms aren’t charged). An extra parameter based on the internal behavior of these atoms is coded along each dimension, playing the role of two more spatial dimensions. They were able to use this system to measure the “second Chern number,” signifying the presence of the fourth-dimensional effects. Rechtsman’s team instead used light passing through a series of wave guides, or specially fabricated glass that can control the shape of the light wave. It kind of looks like an array of fiber optic cables lined up in a rectangular prism (or a box of spaghetti) and like a Lite Brite when observed head on. These cables are coupled—light can travel between the tips. By wiggling the spaghetti noodles in the background, they could simulate the effect of an electric field on a charged particles (represented by photons), as observed in the Lite Brite. The researchers watched light jump to opposite edges and corners of their apparatus. This would be a physical effect associated with the 4D quantum Hall effect. The two experiments fill in two pieces of understanding of this four-dimensional effect. “I think that the two experiments nicely complement each other,” Michael Lohse from the Ludwig-Maximilians University in Germany told Gizmodo. In the simplest sense, the first team of scientists is looking at the 4D effect in the bulk of a physical system, while the the second team is looking at the effects on the edges of the same system. The major limitation of both is that, well, this is not a real four-dimensional system, but two highly engineered systems demonstrating what some effect would look like if it were happening in four dimensions. Both teams have more work they’d like to do in order to study this effect, though. Lohse and Rechtsman told Gizmodo that the atoms and photons in their systems don’t interact with one another. They’d like to see how the effect manifests itself with interacting systems. As for implications, Lohse hopes his system could support the study of even wilder physics, like quantum gravity and Weyl semimetals. Rechtsman thought his system could lead to other photonic devices that take advantage of higher dimensional system, or that perhaps they could find other similar effects in other materials.